TORONTO -- The Calgary Stampeders may have their lucky mascot Quick Six at the Grey Cup after all. The horse charges down the sidelines at McMahon Stadium when the Stampeders score a touchdown. But Grey Cup organizers had said due to the game-day setup, there would be no room for Quick Six to gallop safely when Calgary faces the Toronto Argonauts at Rogers Centre on Sunday. It appears the CFL is rethinking its position. The league met with team officials to discuss Quick Six's status on Wednesday. A CFL spokesman says the league is trying to accommodate Quick Six. "Grey Cup is all about traditions and Calgary's horse is one of those great traditions," said Jamie Dykstra. "We do have safety concerns but we're doing our best to work those out to accommodate the request." The Stampeders arrived in Toronto on Tuesday but Quick Six and Karyn Drake, who has ridden Calgary's TD horse for 19 years and five Grey Cups, stayed behind in Alberta. Argos defensive end Ricky Foley grew up with animals on his family's far in Courtice, Ont., roughly 70 kilometres east of Toronto. But he's not a fan of Quick Six being at Rogers Centre. 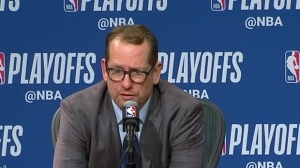 "You have to have a bit of an advantage having the game played in Toronto," he said. 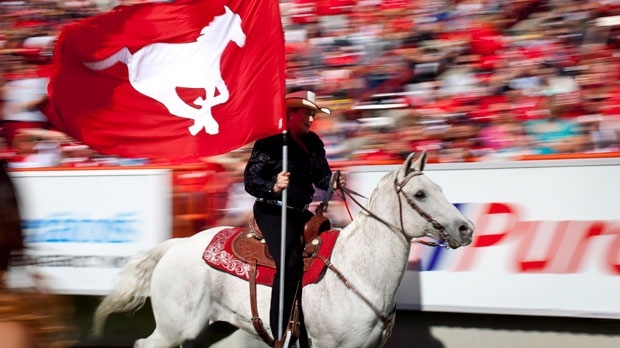 "It would be weird if we had the Stampeders' horse running up and down the sidelines. "I think that's crazy. The CFL's in charge and if they want to do it, fine. Then I guess we'll just have to stop them scoring touchdowns so they don't go up and down the sideline." Foley says he has no problem having a Calgary horse trot into the team hotel, an old Grey Cup tradition. Calgary won its first Grey Cup title in 1948, beating the Ottawa Rough Riders 12-7 at Varsity Stadium in Toronto. That's also when a horse was marched through the lobby of the posh Royal York by Stamps fans. But hotel officials have said they don't want a repeat occurrence and wouldn't support any move to have a horse in its lobby for the health and safety of both guests and the animal.